Pharmacists, stationers and postcard publishers, Hurstpierpoint. William Mitten was born on November 30, 1819 at Hurstpierpoint, the son of another William Mitten, who for many years was butler at Danny House (see Ian Nelson, ed., Hurstpierpoint - kind and charitable, 2001, Ditchling Press, Burgess Hill). Educated at Lewes, he served an apprenticeship as a pharmaceutical chemist in the town, and then took posts in Brighton and South London, before opening a chemist's shop of his own on the north side of the High Street in Hurstpierpoint, where he remained in business for 56 years. The bow-fronted shop was one of the most attractive in the High Street, but in the 1920s it was demolished to make way for a new building for Barclays Bank, which many considered to be an architecturally unworthy replacement. Mitten specialised in herbal remedies, and worked, it is said, from 7 am to 10 pm. An expert botanist, he was affectionately known to his friends as "The Professor" (Vivienne Manchester, Memories of Hurst, 1975, privately published; David Robinson, Historic Hurstpierpoint in picture postcards, 1986, privately published). He became a worldwide authority on mosses, and identified many thousands of pressed specimens that were sent to Kew Gardens from all over the British Empire. By the time of his death he had amassed a herbarium of 50,000 specimens, the largest collection of mosses in private hands. This is now in the possession of the New York Botanical Garden, along with his notebooks and correspondence. Mitten was a great friend of Bishop James Hannington (later martyred in Uganda), and they spent several holidays together, collecting plants. Vivienne Manchester (page 23) refers to a tour they made in 1881 "along the St. Gotthards Pass to Hospenthal, where they crawled on their hands and knees, with soil-stained pockets bulging with leaves, stalks and trailings of moss. They were dressed in old suits, baggy at the knees and elbows, and James had on his head a grass hat, like an inverted flower pot, with a pocket hanky wound loosely round it to shade his sun-scorched face". William Mitten's wife, Ann, was six years his senior and came from Wennington in Hampshire. They had four daughters. The eldest, Ann Jordan Mitten ("Annie"), was born in 1846 and in 1866 married the distinguished naturalist, Alfred Russell Wallace (1823-1913), who co-founded the Theory of Evolution with Charles Darwin. For some years after their marriage, the couple lived with William and Ann Mitten at their house, Treeps, near the White Horse pub at the western end of Hurstpierpoint High Street. The other three daughters never married: they were Rose Mitten (born 1847), Flora Mitten (born 1850) and Bessie Jordan Mitten (born 1854). William Mitten sold not only medicines and herbal remedies in his shop but also books, stationery, newspapers and picture postcards. Flora helped to run the shop and Nelson notes she was one of the first women to be registered in England as a pharmaceutical chemist. Bessie also provided much needed assistance. When William died aged 86 on July 20, 1906, Flora continued the business with Bessie's help until at least 1911. 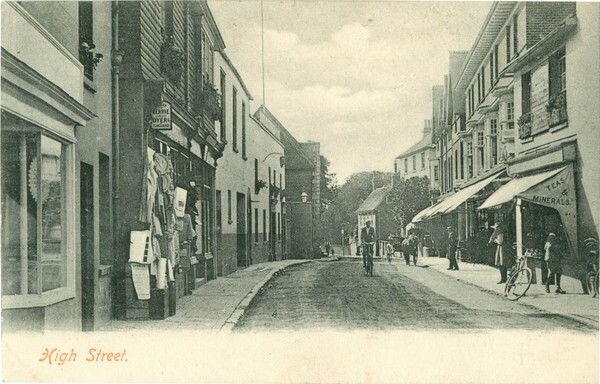 William and Flora published their own range of postcards of Hurstpierpoint and Albourne that were printed for them by a variety of suppliers. Many of the cards were colour-printed halftones supplied by the G.A.P. Co. of London, which seem to have sold quite well despite being of poor quality. Much more collectible are some high definition black and white collotypes printed in Saxony (and possibly supplied by Hartmann) and some photogravures, also of good quality, that may have been printed in Britain. The Mezzotint Co. of Brighton anonymously printed some other collotypes for the Mittens. Most of the Mezzotint cards are black and white, but some delicately hand-tinted cards have been seen. As far as is known, the Mittens did not publish any real photographic cards of Hurst; if they did so it can only have been anonymously or on a very small scale. The earliest postmark noted on a Mitten card is January 1904, and 1904 to 1908 postmarks are common. Early cards are labelled on the back or front: "Published by W & F Mitten". Some carry the additional words: "Photo. F. Mitten". Cards produced after William Mitten died in 1906 are labelled "Published by F. Mitten, Hurstpierpoint, Sussex". It seems likely that Flora took most if not all the photographs, while her father (during his lifetime) put up the capital to pay specialist firms to print the cards. After their father's death, the three Mitten sisters continued to live at Treeps until at least 1911. By 1915, however they relocated to Culver Croft in Hurst, where they remained for many years. Flora died in June 1941 aged 90. Ian Nelson in his book, Hurstpierpoint - kind and charitable, reproduces portrait photographs of both Flora and William.